Dish towels are usually tossed somewhere around the kitchen sink. 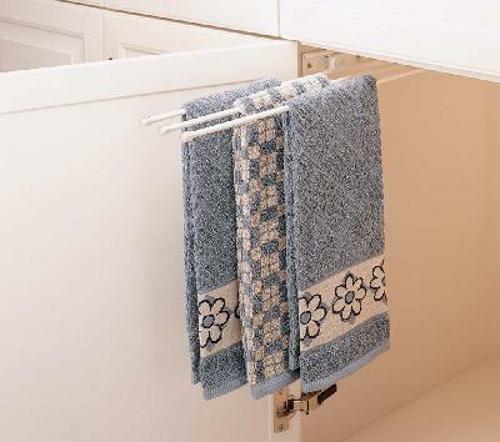 With a towel rack from OVIS, dish towels can be placed under medians or within any cabinet space. A used dish towel is an unsightly thing to behold, especially in an otherwise clean kitchen. All of the towel holders supplied by OVIS are retractable so that they can be easily hidden from view, and accessed as needed. Having extra towels on hand ensures that one will always be ready to get the job done. 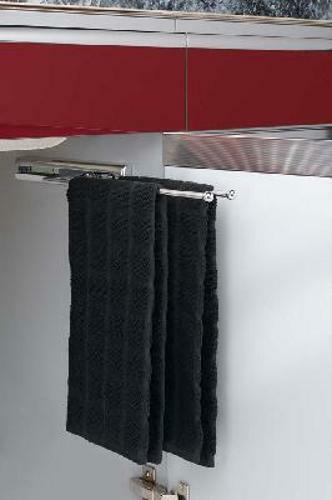 The towel racks supplied by OVIS are all capable of holding multiple towels for maximum utility. Top shelving accessory producer Rev-A-Shelf manufactures all of OVIS' towel holders to ensure top quality and durability. We offer a choice of white or chrome finishes to match nearly any decor. Feel free to browse OVIS' selection of towel holders online to find the perfect addition to your kitchen. This attractive and convenient towel holder will accommodate all common dish towels and fasten to cabinet doors under the sink. Chrome. Towel Holder will accomodate all common dish towels and fasten to cabinet doors under the sink. 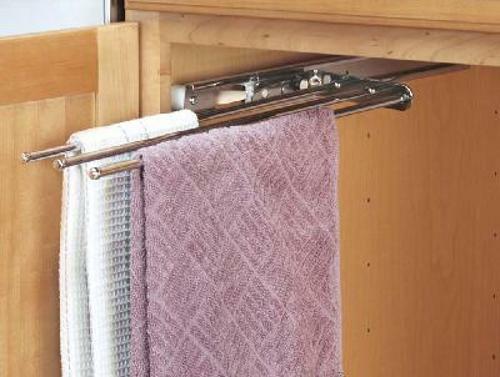 Pull-Out Towel bar has 3 prongs and 12" inch extension for accessibility. Mounting is universal for horizontal or vertical. 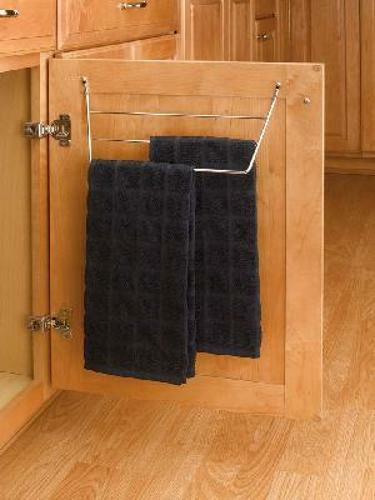 2-Prong Chrome Towel Bar accommodates common dish towels and attaches on inside of the cabinet walls for easy accessibility.